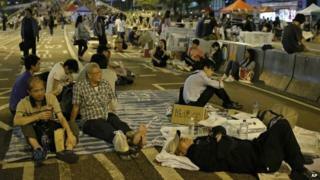 Hong Kong's government has called off a meeting on Friday with student leaders of the pro-democracy movement. Chief Secretary Carrie Lam said it would be "impossible to have a constructive dialogue" after protest leaders called for an increase in efforts to occupy main protest areas. Last week thousands of demonstrators paralysed parts of the city. But mass demonstrations have largely subsided in recent days, although the barricades remain in place. What happens next will largely depend on whether people do indeed rally once again to the cause, prolonging the political crisis, or whether the movement continues to dwindle of its own accord, the BBC's John Sudworth in Hong Kong reports. Hours before Ms Lam's announcement student leaders had asked for an escalation of those activities if concessions were not made by the government. Ms Lam accused them of "undermining trust" in the proposed talks. "The dialogue cannot be deployed as an excuse to incite more people to join the protest," she said. "The illegal occupation activists must stop." Pro-democracy leaders later urged the authorities to return to the negotiating table. "The chaos was caused by the government. They are responsible for cleaning up the mess," Alex Chow, the president of the Hong Kong Federation of Students (HKFS), was quoted as saying by the AFP news agency. Meanwhile, pro-democracy MPs in the former British colony threw their weight behind the protests by pledging to block key legislation. Protesters occupied key parts of the Asian financial hub last week, after riot police used tear gas in a failed attempt to disperse the crowds. Under Hong Kong's current system, the chief executive is elected by a 1,200-person committee that consists primarily of pro-Beijing groups. In August, Beijing said it would allow a public vote in the 2017 elections. However, China wants all candidates to be approved by a similar committee - effectively giving it the ability to screen out candidates.